Samuel Rogers (30 July 1763 – 18 December 1855) was an English poet, during his lifetime one of the most celebrated, although his fame has long since been eclipsed by his Romantic colleagues and friends Wordsworth, Coleridge and Byron. His recollections of these and other friends such as Charles James Fox are key sources for information about London artistic and literary life, with which he was intimate, and which he used his wealth to support. He made his money as a banker and was also a discriminating art collector. A few days after the death of Mr. Rogers, in 1855, there appeared the following interesting record of him from the practised pen of Mr. Robert Carruthers, who long enjoyed the friendship of the distinguished poet and patron of artists and men of letters. Byron’s sensitiveness coloured all he saw with his own feeling. There was none of this misery resulting from Rogers’s taste. He enjoyed life—had money, fame, honour, love, and troops of friends. His recipe for long life was “temperance, the bath, flesh-brush, and don’t fret.” But his house was really a magazine of marvels—the saloon of the Muses!—and its opening view on the garden and lawn of the Green Park in itself a picture. Paintings by Titian, Guido, Rubens, Claude, Raphael, and English artists, covered the walls. Every school, Italian and Spanish, had the representative, and not the least prized were the native landscapes of Wilson and Gainsborough, and the “Strawberry Girl” and “Puck” of Sir Joshua Reynolds. In the hall were Greek sculptures, busts, and vases, with endless articles of virtu. The library had its rare and choice editions—a drawing by Raphael, an original bust of Pope by Roubiliac, antique gems and cameos, and many precious manuscripts. Two of these he lately presented to the British Museum—Milton’s agreement with his bookseller for the copyright of “Paradise Lost” (for which he gave a hundred guineas), and Dryden’s contract with his publisher, Jacob Tonson. The whole arrangement of these rooms bespoke consummate taste and carelessness of cost. The chimney-piece of the drawing-room was of Carrera marble, sculptured with bas-reliefs and miniature statues by Flaxman; and the panels of a small library displayed the “Seven Ages of Man,” painted by Stothard. To comprehend how so much was done by one less than a noble, we must recollect Rogers’s bank, his exquisite taste, and his long life. He had written Journals of Conversations with Fox, Erskine, Horne, Tooke, and the Duke of Wellington (some of which we have seen), and those can scarcely fail to be both interesting and valuable. The severity of remark alluded to by Byron as characteristic of his friend, was displayed in a certain quaint shrewdness and sarcasm with which his conversation abounded, though rarely taking an offensive form. He could pay compliments as pointed as his sarcasm. Moore has recorded the pleasure he derived from one of Rogers’s remarks—”What a lucky fellow you are! Surely you must have been born with a rose on your lips and a nightingale singing on the top of your bed.” These and many other sayings, pleasant and severe, will now be remembered. But higher associations, even apart from his genius, will be associated with the name of Samuel Rogers. 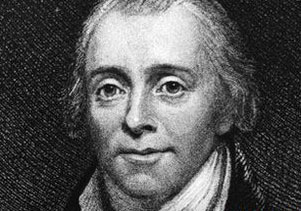 His generosity and taste—his readiness to oblige and serve, or to encourage and reward the humblest labourer in the literary vineyard—his devotion to all intellectual and liberal pursuits—the jealousy with which he guarded the dignity and rights of literature—the example of a straight path and spotless life extended to more than ninety-two years; these are honours and distinctions which will “gather round his tomb,” and outlast his monument. 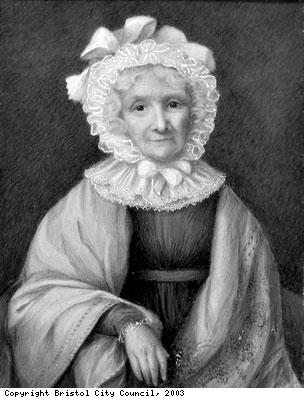 Lady Pendleton, Damian Ashby’s eccentric aunt (see the epilogue to Treasuring Theresa on Susana’s web site), is visiting Susana from the early 19th century. 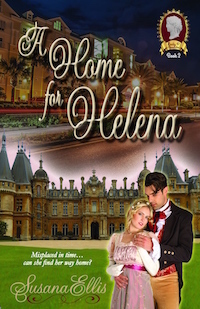 She’s intrigued by life in 21st century Toledo, Ohio, and, of course, Susana is thrilled to have the opportunity to pick her brain about life in Regency England. 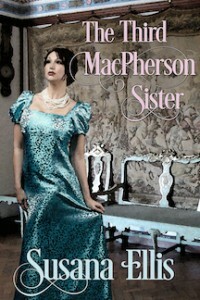 It certainly gives her a great deal to write about in Susana’s Parlour! Susana: Lady P and I recently returned to Ohio after spending a month in Florida where she enjoyed taking daily “constitutionals” around the retirement village where my parents live, and eventually condescended to take a dip in the heated pool, although the bathing costume she rigged for herself raised more than a few eyebrows from the other swimmers. Lady P [indignantly]: My dear Susana, I could not possibly have appeared in public in those-those underthings you and your mother wore. I should have been utterly humiliated! Susana: They are called swimsuits, Lady P. Bathing costumes. And that’s what everyone else wore. Lady P [with a hand to her head]: The gentlemen—such as they were—were much worse. I thought I would swoon when I saw those naked chests! Susana [chuckling]: But surely you have seen a bare-chested man before, Lady P. Why, you and Lord P were married for nearly twenty years, were you not? Lady P: Well, of course I did, but not in public, Susana. Why, my Pendleton was exceedingly conscious of propriety. He would never have appeared in public half-dressed; why his valet would have slit his own throat before allowing it! Lady P [shuddering]: Do not even remind me, Susana. The young women’s attire…why they were nearly as naked as the day they were born! Where is their sense of modesty? 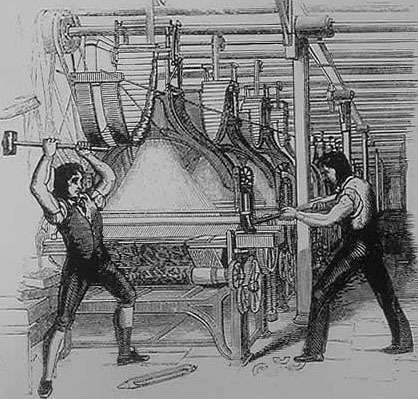 Susana [making a mental note to avoid beaches and pools in the future]: Perhaps we should get back to today’s topic—the Luddite revolt in 1811-12. Can you tell my readers what you recall of that uncertain time? Lady P: Indeed I can, although one could wish to forget it. Susana: It started in the Midlands with the stocking industry, when stockingers, using looms and equipment leased from their employers in their homes, lost more than half their income when they were forced to produce cheap stockings that their employers could sell in larger quantities and increase their profits. Is that correct? Lady P: How could I forget? Those stockings fell apart after barely a week of wear, and even the servants disdained them! Susana: That was the same year the harvest failed, and food prices rose to an alarming level, and more and more people were suffering in economic distress. Lady P: A shilling for a loaf of bread! It was outrageous! Susana: People became desperate, and before long, gangs of disguised men started going around destroying the frames and looms used to produce the stockings to protest the treatment of the workers and the poverty more and more of them were forced to endure. 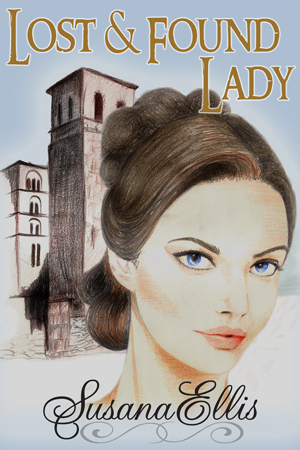 Lady P: That may be how it started, Susana, but it escalated into so much more than that. Why, many of us feared an uprising against the monarchy comparable to the French Terror of barely two decades past. And there wasn’t much to be done about it; Pendleton told me that fully half of the militia had taken up the cudgel for General Ludd in stealth and would turn against their officers in a trice if ordered to put down the revolutionaries. Susana: I’m curious to know what Lord P thought should be done about it. He was a Tory, and the Tories were in power. Did he approve the decision to make frame-breaking a capital offense? Lady P [shaking her head and sighing]: No, of course he did not. He thought it was incredibly stupid to think that masses of starving insurgents could be deterred by fear of the gibbet if they were caught. [Swallowing hard] He was, in fact, quite moved by Lord Byron’s speech in the House of Lords, where he decried the Tories’ attempt to solve the problem by force. He insisted—quite eloquently, Lord P admitted—that the Midland workers were being exploited to increase the profits of a few hosiers, and that the resulting misery benefitted no one. Susana [thoughtfully]: The more things change, the more they stay the same. [Seeing Lady P’s raised eyebrow]: I was just thinking of how the Ohio House of Representatives just voted to eliminate the forty-hour work week so that employers won’t have to pay overtime—pay them double—for working more than that. Lady P: As to that, I can’t say, Susana. But that is one reason I became a Whig. I would never go so far as to overturn the entire government and plunge the country into turmoil and terror such as what happened in France, but I have always believed that certain reforms to prevent the poor from being exploited could be instituted without much upheaval, and that the entire country would be the better for it. [Sighing] Dear Pendleton felt the same, but he was unable to persuade his colleagues to listen to reason. As afraid as they were of a revolution, the only solution the Tories could agree on was to threaten the insurgents. Susana: It wasn’t long after that the Tories fell out of power, didn’t they? After the assassination of the Prime Minister? Lady P: Indeed, and it was well-deserved too. Not because the Whigs’ ideas were much better, although they certainly used the Tories’ imprudence to their advantage. The Prince Regent’s intemperate behavior and his treatment of his wife made him vastly unpopular, so the Whigs took up the cudgel for Princess Caroline, proclaiming that she was being badly treated, and causing more riots, spreading to the north. Susana: And didn’t the people actually cheer the assassin as he was led to his execution a week later? There was that much dissatisfaction with the government that they cheered the murderer of the Prime Minister? Lady P [tight-lipped]: Poor Lord Perceval. He was a good man. Had twelve children, you know. A family man. He could have gone far, if it weren’t for that Bellingham fellow shooting him in the House of Commons. Do you know the government wouldn’t even give him a public funeral because they were fearful of riots? I hardly knew what to say to his wife Jane when I saw her after that. Susana [sighing]: Some things seem so unfair, don’t they? Like my friend whose daughter just died of breast cancer at age thirty-seven. Or many of my friends whose husbands lost their jobs and couldn’t find anything comparable afterward because of their age and the cost of health insurance. What do you say? How do you help them? Lady P [clucking]: I suppose there will always be misery and injustice, no matter how diligently we try to eliminate it. Susana: But that doesn’t mean we should stop trying. Lady P [smiling]: Exactly. Now, Susana, don’t you think something should be done about all the weeds in the back garden? Since the weather turned warmer, they seem to be popping up all over the place. Susana [leaving the room]: Have at ’em, Lady P. There’s a hoe in the shed and some work gloves in the drawer over there. Lady P [frowning]: And where might you be going, then? Susana [from the office]: I have a Christmas story to write. Deadline, you know. Can’t be bothered with weeds for awhile. As always, please do comment if you have any questions you’d like to ask Lady P about the late Georgian/Regency era. She does love to chat! The other day, Lady P and I got to talking about the position of women in the Regency period and how it evolved from the late 18th century when women such as Georgiana Cavendish held political salons and marched in support of political candidates to a time when women were to be saintly and devout and “protected” from the seamier side of life, leaving the important decisions to their sturdier husbands. Lady P: ‘Twas Hannah More and the Evangelicals that popularized it. Women were to be seen and not heard, at the same time obedient to their husbands and revered by them. [Snorting in an unladylike manner] Pendleton and I laughed about it on many an occasion. I’ve never been the obedient sort, and Lord P would not have wed me if I were. Nor did I wish to be worshiped either. The very idea! Susana: No doubt it was a reaction against the excesses of the previous generation. The Devonshire ménage-à-trois, for example. The Prince Regent and his illicit marriage, as well as all of his mistresses and excessive spending. 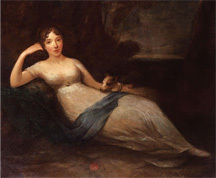 The scandalous behavior of Lady Caroline Lamb. Lady P [Frowning]: There were excesses, of course, which did lead to the pendulum swinging in the other direction. But such extreme changes more often than not led to equally harmful excesses on the other side. Susana: Indeed. I can certainly see that is true in the 21st century. But do explain what you mean, Lady P. What were the harmful excesses caused by the Evangelical movement? Lady P: A popular interpretation of the wife-as-saintly approach was that the husband was allowed and even expected to be a sinner. Susana: Which gave him the freedom to take mistresses and carouse as often as he liked, while his “sainted wife” stayed home and raised the children. Lady P: Well, yes, but it was rather more than that. As unrealistic and unfair as it was to the women, I believe it was equally unfair to the men. Lord Byron, for example. 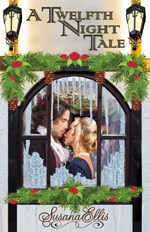 Why would such a dissolute young man choose to marry a staid bluestocking like Annabella Milbanke? Susana: Because she was an heiress and he was close to bankruptcy? Lady P: Then why would she agree to marry him? She had turned him down flat in the past, having recognized that he was a loose screw. Susana: Because opposites attract? Because she thought she could reform him? Lady P: Exactly! She was quite forthcoming about it, actually, and Lord Byron seemed to agree that she would be a good influence on him, at least at first. But as the wedding drew near, he began to have doubts, complaining to his bosom bows that he feared the medicine would be far more disagreeable than the disease itself. Susana: It can be tiresome to be preached at all the time. In a true partnership, both partners accept each other, flaws and all. Lady P: Precisely. In this case, Annabella overestimated her own influence and underestimated the extent of her husband’s vices. She did not know of his immoral relationship with his half-sister Augusta until after the marriage, for example, and like most women who incessantly nag their husbands, she came to be regarded by her husband as a nuisance. Susana: But as you say, Byron was a bit of a loose screw. Would it have worked between them, do you think, if he’d been on some sort of medication? Lady P [with a loud harrumph]: Your society seems to be of the opinion that all can be cured with a tiny pill, Susana, but I’m not so sure. We had quacks touting medicines in our day too. Why, the stories I could tell you about laudanum…! Susana: But getting back to the issue of women’s rights, what did you think of people like Hannah More, Lady P? Was she a good influence or a bad one? She did influence people to care for the poor, did she not? Lady P: Hannah More and those around her were neither good nor bad, Susana. The mistake, in my opinion, is to paint everything in life broadly as either white or black. Hannah More did a great deal to awaken society to the plight of the poor and stir up support on their behalf, that is true. But I believe that she did a disservice to both women and men in promoting the role of women as subservient to men. Susana: But women were still legally the chattel of men, were they not? And they were not given the right to vote for another hundred years. Lady P [somewhat impatiently]: Legally, yes, that is true. But my dear Susana, you must not assume that every marriage was built on such an unequal basis. Discerning women always knew how to manage their husbands, so long as they took care to marry a husband who could be managed, that is. I daresay even the redoubtable Hannah herself could not have managed such a bedlamite as Lord Byron. Susana: But you said yourself that you never told Lord Pendleton about your Whig activities with the Duchess of Devonshire. Lady P: Indeed not. It was for his own protection. His family would have been scandalized. Susana [shaking her head]: Sometimes your logic escapes me, Lady P.
Lady P: I’m not saying that my own marriage was ideal, or that most marriages were not unequal in my day, Susana. There was just as much hypocrisy in society then as there is in your century. Why Hannah herself apologized in her books for having the temerity to write them at all, being a mere woman as she was. My point is that one must consider one’s options and make the wisest choices possible in whatever circumstances one finds oneself. I may have decided to become a Whig, but I wasn’t foolish enough to believe they should have unilateral power. No indeed. Some of their official policies were ridiculous in the extreme, and I was glad there were rational voices on the other side to temper their excesses. Susana: In that respect, I certainly agree with you, Lady P. I find I cannot blindly accept any philosophy or ideology without considering each facet of it on its own merits. But I find it extremely frustrating that there are so many who do, as though they haven’t a brain to think for themselves. Lady P [dryly]: So I’ve noticed that about you. But Susana, it does appear that you are missing the point. People are who they are, and there’s not a lot you can do to change them. My counsel in such cases has always been to do what you can and let the rest be, else you work yourself into a state fit for Bedlam. Susana: [shaking her head]. You remind me so much of Dr. Ellis, author of How To Stubbornly Refuse To Make Yourself Miserable About Anything, Yes Anything. Lady P: What a singular title for a book! The logic seems sound, however. Why, many was the time when Lord P left me alone to go to his club that I could have spent the night fuming, but I decided instead to use that time to follow my own interests. Susana: Such as attend the Whig salons at Devonshire house? Lady P and I just finished watching the 2007 BBC movie about Lord Byron, and I thought you might find some of her reminiscences of the original characters as intriguing as I did. 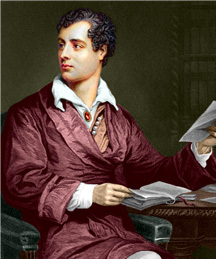 [Turning to Lady P] You knew the real Lord Byron, did you not, Lady P? What was your impression of him? Oh yes, I was acquainted with the man, as was anyone who was anyone in the ton during the spring of 1812 when he came onto the scene. I could never understand why women were making cakes of themselves over him. He wasn’t all that well-favored, you know, not nearly as attractive as that actor who played him in the film. Although he did have a certain magnetism, I suppose, when he looked at a woman with “the stare,” that is, with hooded eyes. I’m not at all sure what he was conveying with that most peculiar stare, but whatever it was had the effect of making formerly sensible women abandon all pretense of prudence in order to attract his attention. Undoubtedly Lady Caroline Lamb was one of them. She was the worst of them, but then, she was always somewhat of a loose screw, Susana. Even when she was small—she was eight years old when her mother, Georgiana’s sister, moved the family into Devonshire House to escape her father’s abuse—Georgiana used to tell me about her flights of fancy and frequent mood swings, and when she married George Lamb and moved into Melbourne House, we all hoped that her husband and Lady Melbourne, his mother, a prominent Whig hostess you know, would prove to be steadying influences on her. It didn’t work out that way, though, did it? Not at all. You know, Susana, it is never a good idea for a newlywed to move in with her husband’s family. Or the other way round, I’m sure. In this case, Caroline clashed constantly with Lady Melbourne, and it only got worse when Caroline and Byron were so foolish as to allow their affair to become public. 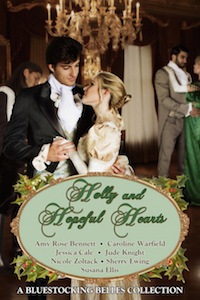 Harriet—Lady Bessborough, Caroline’s mother, you know—tried to rein her in, especially after Lord Byron tried to break things off with her, but Caroline was so far gone from reality that she listened to no one. She foisted herself on his friends and begged them to help her win him back. She threatened to harm herself. She neither ate nor slept and was quite wraith-like when her mother and husband finally persuaded her to go to Ireland with them. But even that wasn’t the end of it. Poor Caroline raved over him until the day she died, alternately loving and hating him. I suppose today she’d be diagnosed bipolar and given medication to help her cope with her illness. Mood swings. You know, when someone is rapturously happy and believes everything is right with the world and doesn’t care if everyone knows it, and then later falls into a serious depression. I’m no psychiatrist, of course, but it does sound to me like she suffered from such an affliction. Well, she did suffer from some sort of affliction, that much is obvious. And I shouldn’t wonder if Lord Byron didn’t suffer from something similar. He too, was something of a loose screw. Although I can’t really say what he was like as a child. I did hear that his father was something of a tyrant, like Caroline’s. What an interesting thought! But did he exhibit an equal passion for her, at least while their affair was still going full-swing? Oh yes, indeed. Of course, when he first came onto the social scene, he was a Nobody and she the reigning Beauty. No doubt he was flattered when she took an interest in him. They were both poets, you know, possessed of mercurial artistic temperaments. 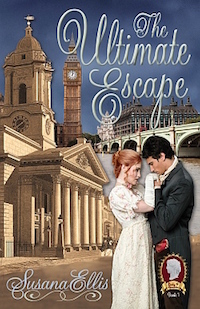 At first, her mad, childlike bravado attracted him, but when Lady Melbourne got her clutches into him and convinced him that Caroline’s antics could make him persona non grata in society, he began to cool toward her. Lady Melbourne? Caroline’s mother-in-law? Why would Lord Byron pay attention to anything she said about Caroline? My dear Susana, Lady Melbourne was one of the premier Whig hostesses, exceedingly attractive for her age, and it was whispered about that Lord Byron was infatuated with her. Yes, even though she was more than thirty years his senior. It does happen, you know. She had many affairs with prominent men, including the Prince Regent, and her son George bears an uncanny resemblance to him too. So why was she so critical of Caroline, then, if she indulged in adulterous affairs herself? The difference between them, my dear Susana, is that Lady Melbourne’s lovers were carefully chosen to increase her influence in political circles. She was also careful to manage them with the utmost discretion. Caroline, well, she had no such scruples. She was the victim of her impulses. And to a lesser extent, Lord Byron was to his as well. I feel so sorry for her. But Lord Byron did not pine away for her, did he? Not at all. He cut a wide swathe among the ladies of London. [Lowering her voice] It is said that he had an incestuous relationship with his half-sister Augusta, and that her daughter Elizabeth is his. Goodness! For a society so bent on propriety, there was certainly a great deal of scandalous goings-on! Oh yes indeed! It was keeping up appearances that was the important thing. So hypocritical. Why, I always thought it was beyond outrageous when Lady Swindon cast her maid into the streets for being with child when she herself was having an affair with the Duke of Kent. I do hope I was able to instill better principles into my own daughters while they were growing up. Lord Byron eventually married, did he not? I heard that his daughter Ada was the world’s first computer programmer. Computer programmer? Well, I can’t speak to that, since I have no notion of what that is, except for that machine you use for your writing. But yes, he did marry Annabella Milbank, who was Lady Melbourne’s favorite niece and an heiress besides. And now that I think on it, I do recall that she was thought to be something of a bluestocking, so it is likely that she would have an intelligent daughter. Why, Annabella was better educated than most of the men of the ton; you’d have thought she’d have better sense than to marry a sad rattle like George Byron. Those mesmerizing, hooded stares of his, no doubt. She probably thought she could reform him. She was quite a devout young lady, I believe. [Shaking her head] Such a shame. Why, I made sure my girls knew better than to attempt such a thing with their husbands. There are ways a woman can influence her husband’s opinions—I can certainly attest to that—but it is far better to choose a mate who doesn’t require a great deal of changing. Do remember that, Susana.